The Royal Canadian Mint today launched the newest release from its Canadian Birds of Prey 99.99% pure silver bullion coin series with a majestic tribute to the Bald Eagle. This iconic ruler of North American skies is dramatically portrayed on a 1oz bullion coin that is sure to appeal to a wide range of customers for both its theme and signature purity. It is now shipping to the Mint's network of official bullion distributors as online dealers begin accepting orders today. "The Royal Canadian Mint is committed to remaining a leader in the precious metal market by offering investors a continually evolving suite of bullion products crafted with exceptional attention to quality and purity," said Marc Brûlé, Interim President and CEO of the Royal Canadian Mint. "The Birds of Prey - Bald Eagle 99.99% pure silver bullion coin has a theme whose appeal and relevance transcends borders and we expect it will shine a new light on the diversity of our investment products." 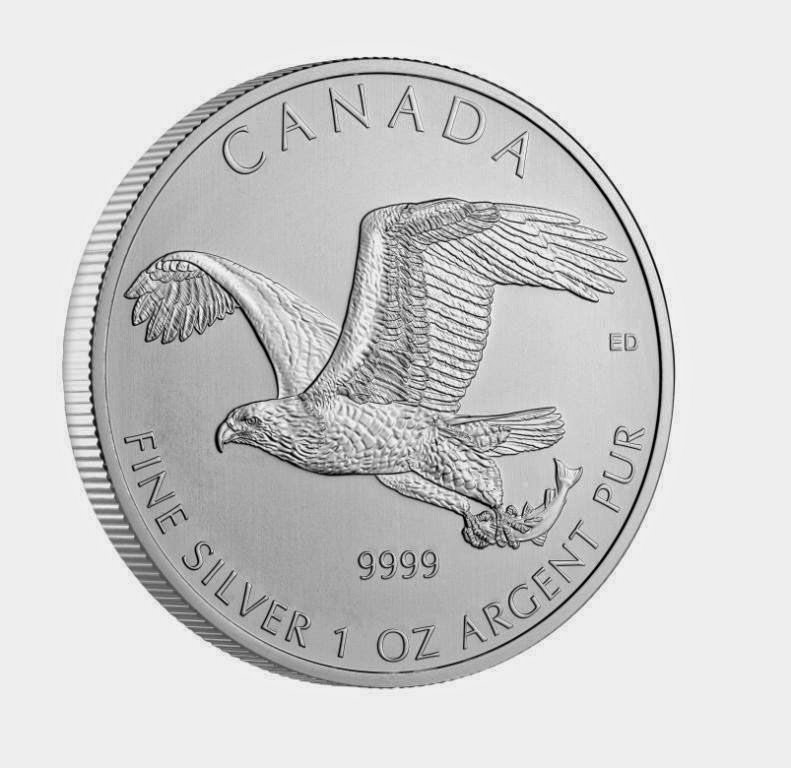 The 2014-dated, "Bald Eagle" 99.99% pure silver bullion coin is the second of four coins in the Mint's exciting biannual bullion series featuring Canadian birds of prey. Its reverse design features a captivating illustration by acclaimed Canadian illustrator Emily Damstra of a Bald Eagle in full flight clutching a fish in its powerful talons. This 99.99% pure silver coin is crafted with the Mint's signature bullion finish is limited to only one million coins world-wide. A numismatic version with a proof finish, limited only 7,500 examples, has also been produced and can be ordered on www.mint.ca as of today. Silver Gold Bull is your trusted silver & gold dealer. They will provide you with bargain, up-to-minute pricing and they will ensure your precious metals arrives to your door discreetly and fully insured.